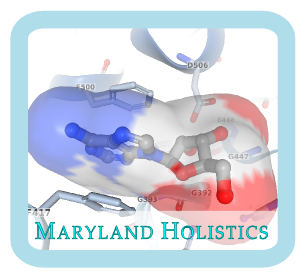 Maryland Holistics is on an exciting journey of exploration and discovery. Our research focuses on understanding the biochemical effects of acupuncture and the nature of the body's healing response. In our clinic, we have observed that some patients with serious, chronic, painful, and disabling diseases can be apparently cured after 5-10 sessions of acupuncture. These observations have guided us toward an unstoppable hope and confidence in the body's ability to heal, even when an illness has not healed through conventional medicine, and even when the illness has persisted for many years. Over the past 12 years, our clinical director has provided acupuncture to thousands of patients, and he has seen that acupuncture consistently helps the vast majority of patients to enjoy a better quality of life with fewer symptoms of pain or illness. Many important scientific questions remain about how acupuncture works in terms of biochemistry and cell biology. Currently, the scientific understanding of acupuncture is expanding exponentially at a breathtaking pace. Each month, between 50 and 100 scientific papers are published in the field of acupuncture. These papers have appeared in some of the most respected journals of medicine, including Nature. This diagram is one of our simplified and modernized interpretations of traditional acupuncture physiology. Its organization is based on concepts which are common to most branches of traditional acupuncture. Just like in an automobile, if one part of the body's energy system breaks down, the engine can break down. In the body, this can result in pain, fatigue, stress, inflammation, and disease. A skilled acupuncturist helps to restore the body to health by carefully selecting acupuncture points for each patient's condition and health status, and by manually adjusting these needles in a way that stimulates the body's healing response. Many people who are interested in acupuncture, or even practitioners of acupuncture, may find acupuncture difficult to explain. Often it is described in terms of qi energy moving through pathways called meridians. But for those of us who enjoy thinking scientifically and logically, the concept of qi energy seems terribly vague, new agey, and unsatisfying. 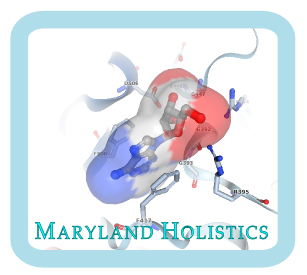 At Maryland Holistics, we believe the traditional concept of qi energy is useful but not detailed enough to fully explain the profound strengths of acupuncture. A complete understanding of acupuncture requires a thorough understanding of acupuncture's effects at the molecular level. Fortunately, this type of information is rapidly being discovered and catalogued by researchers around the world. This information brings enormous value by helping health care providers to optimize the use of acupuncture for specific patients and disorders. The main reason why acupuncture is difficult to explain is that science does not yet fully understand the body's healing response. At the cellular level, the human body manufactures at least 30,000 types of proteins, if not many more, and these proteins have many different jobs within cells. When these go awry, disease results. However, currently, even the most advanced computers cannot accurately model all of the activities of all of these proteins. Acupuncture is clearly different from a pharmaceutical treatment. Most pharmaceutical treatments are transported through the bloodstream as a single type of molecule, and act upon a single type of enzyme or receptor on the surface of cells. This pharmacological activity leads to benefits as well as side-effects. Acupuncture, in contrast, is a microscopic injury to the surface of the body, at very specific physical locations which are relevant to the body's healing response. Once acupuncture points are stimulated, cells are disrupted causing molecules of various types to leave the site of the acupuncture point. These include signaling molecules which travel through the body, influencing the activities of nerves and immune cells. The body's natural healing response is stimulated, which is why acupuncture is effective with virtually no side-effects. Acupuncture research at Harvard Medical School and many other institutions around the world have determined that acupuncture has profound effects on the body's physiology. These include a wide range of molecular and cellular effects on the immune system, nervous system, endocrine system, and growth-regulatory systems. Acupuncture reduces the level of the inflammatory cytokine TNF-α within blood plasma, and reduces blood pressure, at least partly through reduction of plasma renin, but leaves plasma levels of vasopressin unchanged. Although we are very interested in the life sciences, our primary commitment is to public health. We seek knowledge and understanding so that more people can experience the joy of a long, fulfilling, comfortable, and healthy life. If you, or a loved one, are interested in trying acupuncture, we invite you to schedule an appointment at our clinic by calling us at 301-588-5858. You will be taking an excellent step forward in your health. Most of our patients feel much better immediately after the first session or within a few sessions. 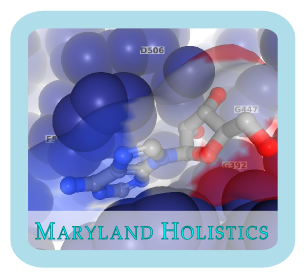 At Maryland Holistics, we wholeheartedly invite you to participate with us on this exciting journey. Individuals and institutions who wish to support our research through donations or other ways are invited to contact us by phone at 301-588-5858. References: Knapp K, Zebisch M, Pippel J, El-Tayeb A, Muller CE, Strater N. Crystal structure of the human ecto-5'-nucleotidase (CD73): insights into the regulation of purinergic signaling. Structure. 2012 Dec 5;20(12):2161-73. doi: 10.1016/j.str.2012.10.001. Epub 2012 Nov 8.